There is no place in the world more dynamic than China. Change is the essence of being in China. The only way to connect to China is to embrace change. At least, that is what Chinese companies teach us. Indeed, it is time to look east, to learn from China, to embrace and absorb innovative ways of doing business. My interest has always been to understand how organizations can thrive on uncertainty rather than treat uncertainty as a problem. 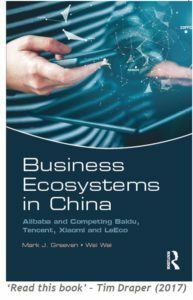 My decade long research on China’s digital business ecosystems – Baidu, Alibaba, Tencent, Xiaomi and LeEco – and on hidden innovators – technology ventures, change makers and hidden champions – all point in the same direction. Chinese companies excel in boundaryless ways of organizing and leverage digital technologies to do so successfully. It is necessary to ‘connect digitally’ and ‘disconnect organizationally’ to be able to embrace the dynamics in China.